BURLINGTON, MA -- (MARKET WIRE) -- August 30, 2005 -- Intranets.com (http://www.intranets.com), the world's leading provider of on-demand collaboration services, today announced the launch of a new user interface that includes a fresh look and feel, improved layout, and several advanced customization options. This major upgrade is the direct result of months of user testing as well as ongoing feedback from customers worldwide. 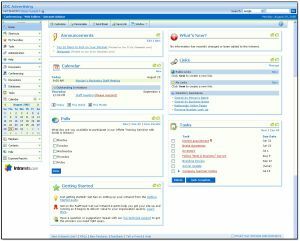 Beginning immediately, Intranets.com users will have a more intuitive and flexible design that includes custom short cuts, quick links, full menu control, and much more. All of the new features are designed to give the company's 300,000 plus users more control over their information and more freedom to personalize the look and navigation of the Intranets.com collaboration suite. "As members of the Intranets.com Customer Advisory Council, we have been beta testing the new user interface for several weeks and we are elated with the new features -- many that we suggested have been incorporated into the new interface," said Michael Hartley, vice president of Dale K. Ehrhart, Inc. "We have found the new design to be more aesthetically pleasing and we anticipate that the new layout and enhanced features will help us work more fluidly and effectively." items to fit a group's specific needs. when the full menu is needed again. within or outside of the Intranets.com service. "We overhauled the entire look and feel of our collaboration service to make it even easier to use and more customizable," said Karen Leavitt, vice president of marketing at Intranets.com. "The feedback from our customers played an important role in our new design and we are delighted to deliver the tools they've been asking for. This upgrade represents a major leap forward for our product and gives us added flexibility to introduce new applications designed to help our customers run their businesses even more effectively." Intranets.com is the world's leading provider of on-demand collaboration services for small businesses or departments and groups inside large organizations. The company serves more than 300,000 users across 10,000 companies worldwide and offers a secure, web-based collaboration suite to share critical business information quickly and easily at any time from anywhere. Privately held and profitable, Intranets.com is led by an experienced team of software industry professionals who are committed to providing a secure, customizable, easy-to-deploy intranet solution supported by world-class customer service. Intranets.com is a PC Magazine "Editor's Choice" winner and is rated one of the world's "Top 25" leading service providers by ASPNews. The company has also been ranked by the Boston Business Journal as one of the fastest growing private companies in Massachusetts for two consecutive years. For more information or to take a FREE 30-day test drive, visit http://www.intranets.com/pr, e-mail corpsales@intranets.com or call 888-932-2600 or 781-565-6000.